Topical anaesthetic cream is available from your local pharmacy in 5g tubes for around £6 each. Please aim to purchase your anaesthetic cream a minimum of two weeks before your appointment as not all pharmacys keep it in stock! Anaesthetic cream is a requirement for Ear Lobe Repair – we will not perform the procedure if you arrive for your appointment without having applied the cream as directed below. Because the cream takes 2 hours to be fully effective, we cannot apply this in the studio as it would double your appointment time. Thoroughly wash the area(s) with anti-bacterial soap, then dry. Liberally apply a massive visible blob of cream (front and back if applying to ear lobes) – DO NOT RUB THIS IN. If you can still see your ear lobe then you have not applied enough cream. Cover the area with cling film to seal the cream in. The cream has a high evaporation rate and will evaporate quicker than your skin can absorb it if not covered correctly. The cling film will stick to the cream easily to keep it in place – if the cling film doesn’t stick, then you haven’t put enough cream on. When the cream has been absorbed (ie. the cream is no longer visible) re-apply from step 2 as often as needed. This is usually done at least twice before your appointment and one last top-up when you arrive. The more cream you use, the more numb the area will be! 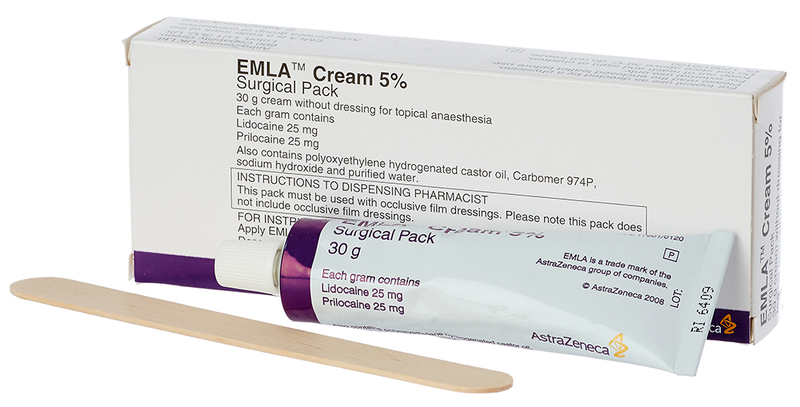 Topical Anaesthetic cream contains Lidocaine. By applying this product to yourself you agree that it is at your own risk.